Quebec is tipped to become the Western Hemisphere hub for lithium production as the market for the energy metal so crucial for electric vehicles and energy storage faces a prolonged supply deficit and demand explosion. The French-speaking Canadian state already has a number of well-advanced lithium projects and Critical Elements is next in line to push forward into production with the fully-funded, high quality Rose lithium project. President Steffen Haber outlines what’s next for the company as it works to enter the flourishing lithium market. Haber was appointed in late 2016 and he makes up a highly experienced management team taking the Rose project forward. Having been CEO of Rockwood Lithium until it was acquired by Albermarle for $6.2 billion in 2015, he has vast experience in building lithium projects. In addition Critical Elements’ CEO Jean-Sébastien Lavallée and project manager Paul Bonneville both grew up in the Quebec mining industry and are experts in hard rock mining in the region. On the finance side Jean-François Meilleur, a specialist in the North American capital markets, is leading the operations. 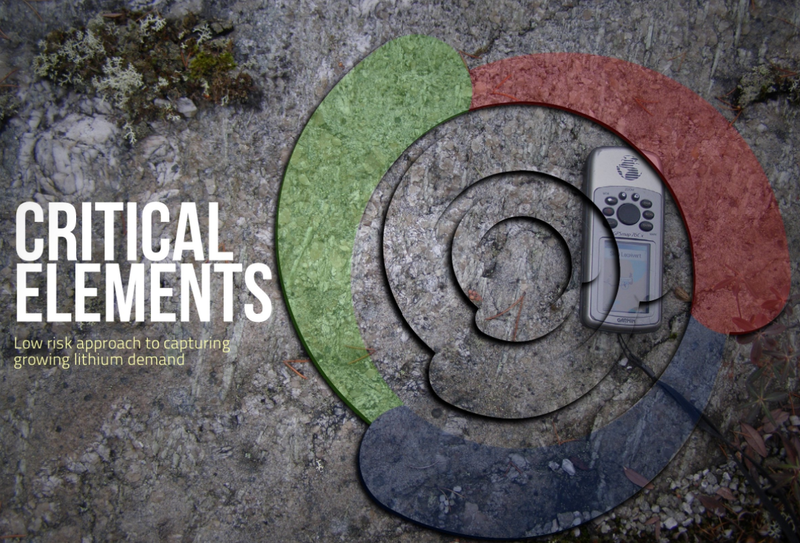 Critical Elements published a pre-feasibility study in 2011 and is now in the process of announcing a definitive feasibility study at Rose, due to be published in June or July. Now the focus is on informing the market of the results in processing spodumene with the target of bringing spodumene concentrate to the market in 2019. The company announced the success pilot plant trials in April, highlights including lithium concentrate grades of up to 6.65% and recoveries at 85.4%. “I am very excited about our pilot plant results, which highlight the low risk profile of the project. The lithium market is desperately looking for new, reliable, and sustainable suppliers like Critical Elements, as yearly demand for lithium carbonate is expected to grow from 200,000 million tonnes (mt), to more than 600,000mt,” said Haber in the announcement. 7% technical grade spodumene will initially be produced for the global glass and ceramics market as well as 6% chemical grade spodumene for the conversion market in China before Critical Elements pursues the second phase of the project which entails the construction of a lithium carbonate plant, expected in 2022/2023, to supply high grade lithium carbonate to the battery market. The two-phase approach allows the company to enter a cashflow generative position early on, on the back of simple open pit mining for technical and chemical grade spodumene from 2019 while it develops and commissions the second phase and more profitable lithium carbonate production operation. Haber says that as well as generating early cash flow the two-stage approach also minimises the risk of a dual ramp up of a mine and chemical plant. The Canadian / German -managed company is sitting on a very positive asset to enter the lithium market in time with the supply deficit. With the project located in Quebec it has a number of key advantages on its side in terms of existing infrastructure, access to a highly skilled local labour force, low risk processing technique and, crucially, a high quality ore body. Rose is blessed with easy access to roads, low cost power and skilled labour thanks to the current environment for mining in Quebec. Critical Elements has built up strong relationships with the First Nation communities and local and provincial governments and it is located in what Haber describes as a premier mining jurisdiction in Quebec. The deposit itself as Rose could certainly be described as unique globally. It’s a homogenous ore body with recoveries above 90%, it’s near surface, easy to mine, with a 17-year mine life and there is significant exploration upside potential in the future. All of that points towards Critical Elements being able to act on the low risk entry strategy to capture the growing lithium demand coming from its use in electric vehicles and battery storage. In addition, Critical Elements has entered a transformative agreement with German chemical distribution company Helm AG as strategic investors in exchange for a ‘take or pay’ off-take for all production at the Rose project. Helm and Investisement Quebec, the Canadian ground cooperation fund, will provide 100% of the equity to finance the project going forward. Helm will also contribute to the project on the engineering and construction phases and Haber says it will be of huge benefit to take advantage of the company’s two decades worth of experience in the market. However, with the market expecting significant increases for lithium carbonate Critical Elements will not be constrained by a fixed price. Helm has an obligation to take all of the product and the sale price will be at market price on a month-by-month basis. The next step for Critical Element will be to publish the definitive feasibility for chemical grade spodumene in mid-2017 then begin detail engineering work for the spodumene concentrate plant, concurrently applying for permits with the Canadian authorities. Hoping to commission the spodumene concentrate plant in Q2/Q3 2019 Haber expects to have finalised piloting of lithium carbonate in Q3 2017 too. The bankable feasibility study for the lithium carbonate at battery grade is targeted for Q1 2018 and then the company will move into detailed engineering for the second phase of the project. “The carbonate plant is much more complex than the spodumene plant so it might take a bit longer but our target is to enter construction in 2020,” notes Haber. The early cash flow from the technical and chemical grade spodumene will ‘substantially’ support the construction of the lithium carbonate fund as well as other by-product cash flow from tantalum, for example. Where the company has not been recognised completely in the market is that as well as having the Rose project in advancing, Critical Elements also has claim to a very large mining licence in the region and there are significant opportunities in terms of exploration to add additional lithium projects to the portfolio. “We have already entered into a joint venture with Lepidico in Australia in order to develop other resources which are part of our mining claims and we are looking into investigating and developing other mining areas which are covered by our legal mining right,” Haber observes. Critical Element’s story as it enters the next stage of progression is one of a low risk entry to the lithium market. On the project side there are so many factors in the company’s favour and when that is coupled with the demand scenario over the next few years the company is in a prime position to prosper in a rising lithium environment. With the right management in place this is definitely a company to watch in the lithium space.